So I have been a wee bit busy this month, but I want to catch up a few things. 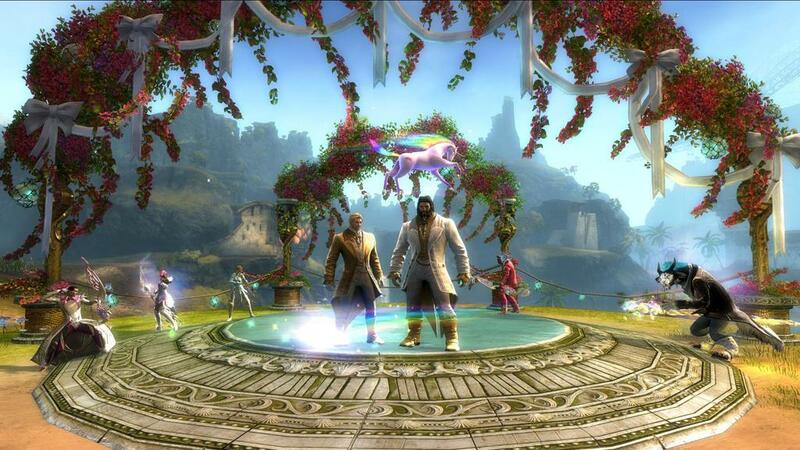 Lion's Arch gets a wedding area, then the Supreme Court rules on marriage. First off, the NTRPG was real treat. A small convention with a very low Fan/Pro ratio (like ten of the former to one of the latter), it was a combination of an Old School Game Designer Reunion and a Small Relaxing Con. I ran events for the first time in many, many years, and people seemed to like it. Strongly recommended. Also, I've been reducing my social media postings (but that's another blog for later), but my Facebook page blew up over an article on io9 over the original Marvel Super Heroes RPG that Steve Winter and I put together (cough, cough) thirty some years ago. Almost all the comments were supportive and it is very, very rewarding to see that the game has continued to be a fan favorite for low these many years. And speaking of increased web presence, I was particularly pleased to see that Dave Gross's latest book, Lord of Runes, got a mention on Geeksmash as a recommended June reading. Given that shared world novels are often considered the children of a lesser god compared to more mainstream offerings, I'm delighted to see Dave's name invoked in the same article with Robert Charles Wilson and Vernor Vinge. In other news involving fellow creatives, Nichole Lindroos, Chris Pramas and the gang at Green Ronin are re-launching Blue Rose with a Kickstarter. Blue Rose was a non-traditional traditional fantasy that puts more emphasis on epic romance than epic monster bashing. Yes, it is knocking down stretch goals like ten-pins, but still has a while to run. As a fan of multiple flavors of fantasy, I liked the original, and expect to like the new version, powered by the Dragon Age system. And one more thing. The short list for the ENnie awards is out, and I'm glad to see a number of things that I have purchased and enjoyed being on that list, in particular the Hoard of the Dragon Queen adventure and the Guide to Glorantha megabooks. Check out the full list of nominees here. And yes, I will be at GenCon this year. More about that later. This coming weekend,4-7 June, I will be attending the North Texas RPG Con at the DFW Airport Marriot in Fort Worth. It looks like a fun weekend of gaming, topped off with an all-star list of veteran game designers (about a half-dozen of them from Seattle, so it will be a weird flight). Yep, I know about the weather conditions there, but we're only just south of the airport, and there are no major rivers between the terminal and us.